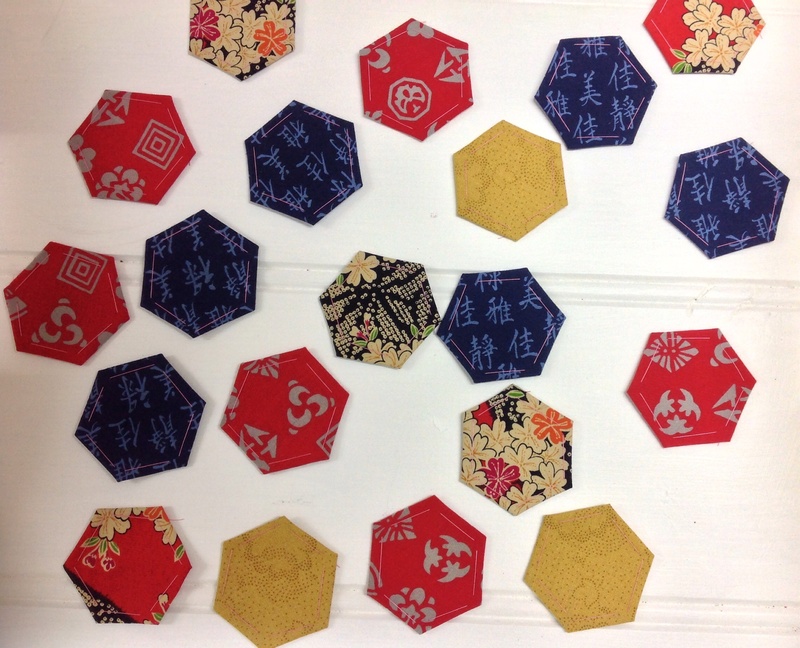 The hexie craze has infected my ladies! Last time I looked there was the occasional person folding small pieces of fabric around six-sided cardboard cutouts but now every second project is a lesson in geometry. 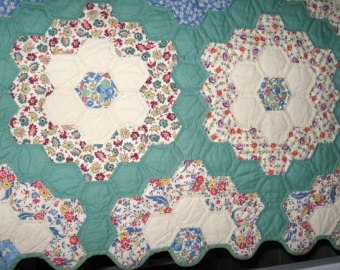 Now if you say “hexagon quilt” I see a Grandmother’s Garden – a design that became synonymous for many people with the depression but which actually developed long before that – in the early 18th century in fact. What it became synonymous for me was with the shortie pyjamas that Nanna used to give my sister and I for Christmas and which I did not appreciate as much as I possibly should have. In fact these dreadful garments caused great angst, so ugly were they, that I was forever unable to appreciate reproduction fabrics – merely because they evoked the small floral patterns from which the offending articles were invariably made! 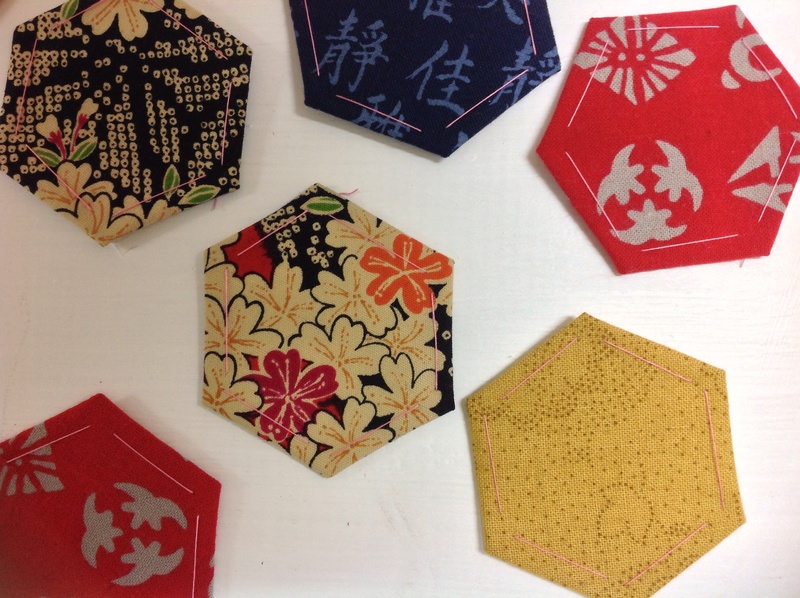 And now the hexie is back – and in a big way. Like many annoying crazes of the not-too-distant past I had hoped the hexie would be a short-lived folly like the Macarena, planking, the ice bucket challenge and the penchant for geriatric bands to tour again even though they haven’t released an album since I was in flares and had a perm). Alas no the madness has taken hold. Now my classes are full of people with looks of concentration fabricating six-sided polygons. So it was that I unhappily wandered past each person’s chair at this week’s classes. 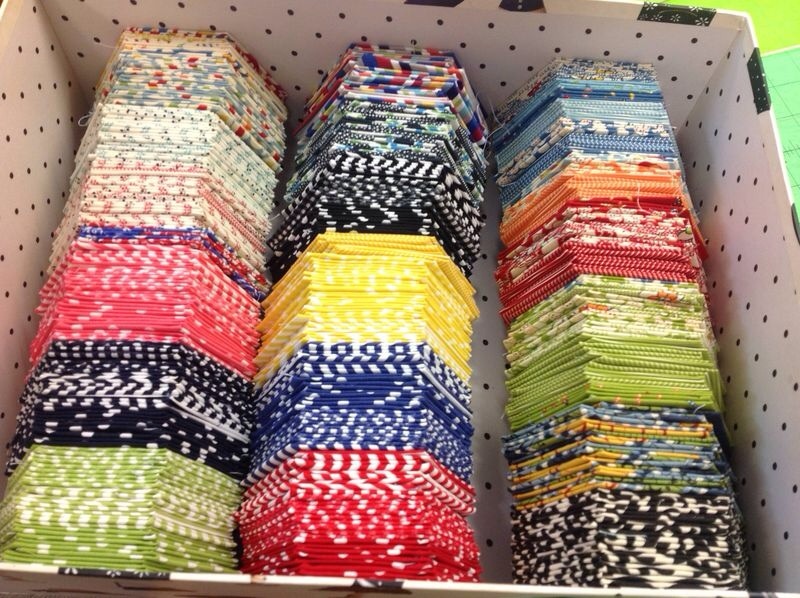 I had noticed the precise folding and the meticulous hand sewing. I had noticed the manufacturers of these shapes seemed to be strangely ‘at one with the universe’ and perfectly content to watch the little pile in front of them slowly becoming taller as each new piece of the ultimate puzzle was completed. As I looked closer I was overcome with what I can only describe was a revelation. I was surprised to find that I found here a particular colour scheme strangely pleasant, and there the arrangement quite striking. There was not a faded, drab shape to be seen. Brilliant scarlets complemented deepest indigos and the saturated colours of Kaffe Fasset fabrics became even more alive if that is possible. Surely I could not have been wrong about these honeycombs! But yes it was true. I found myself drawn to these creations. After the classes I started looking at various projects that could extend the challenges associated with the humble shape. I thought about establishing a ‘Hexie Club’ at Apatchy. Projects came to life in my imagination as I contemplated what could be achieved with this artistic adventure. I fear I am now infected too. And like ‘The Plague‘ ” I have no idea what’s awaiting me or what will happen when this all ends”. Stay tuned. 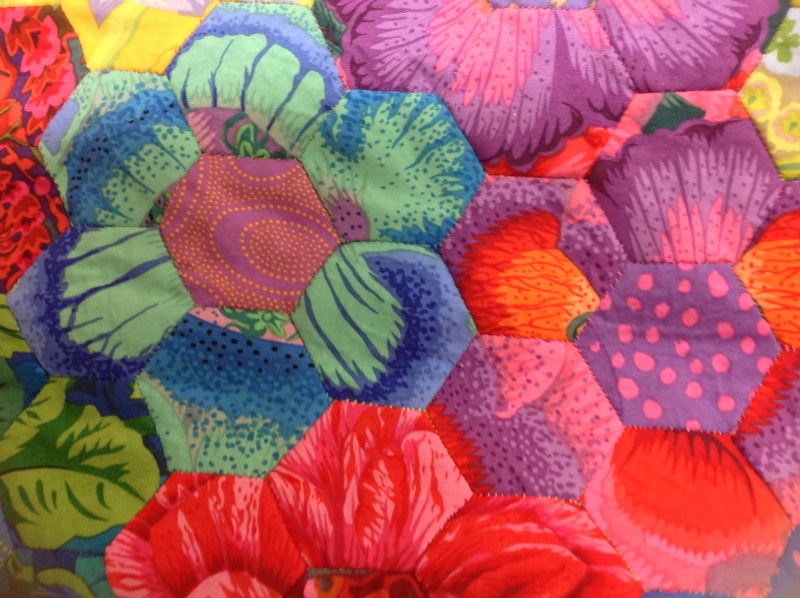 This entry was posted in Hexies, Uncategorized and tagged Hexagon quilts, Hexies by Apatchy Kaye. Bookmark the permalink. 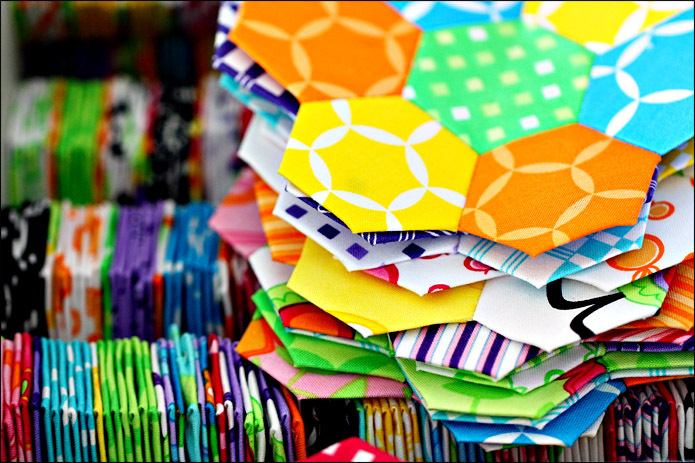 I love hexagons and I love how organised the ladies are. I can’t wait to visit my son in Clayfield and join in with one of your classes.